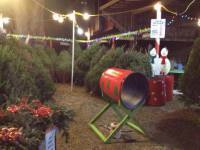 Winter Works tree lot of Bordentown City, NJ is approaching its 5th year running and we couldn't be happier! We have a variety of trees to offer and we always make sure they always go home with a fresh cut. Our prices are highly competitive with big names such as walmart & lowes (sometimes were even cheaper) and we try to go the extra mile by offering the fresh cut and free local delivery. 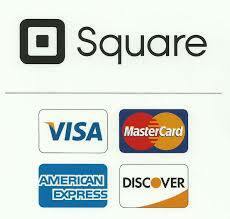 Yes, I said FREE same day local delivery which includes Bordentown City/Twp. and Fieldsboro. Santa stops by frequently to spread the holiday cheer and even sets aside a couple of days to hang out and take pictures (for free of course). We offer 3 types of trees, the Frazier, Balsam, and Douglas Fir. The sizes range from 4-12 foot. We also have table toppers, wreaths, grave blankets and much more Christmas decor. The historic town of Bordentown City has so much charm and history. Around Christmas it's absolutely magical with the toy soldier and snowman along with snowflakes illuminating Farnsworth Ave. Walking uptown in December will definitely put you in the holiday spirit. 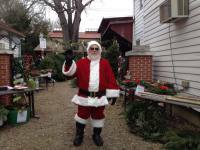 In December alone, Bordentown offers a chocolate walk, train display, day of carriage rides and the tree lighting. Enjoy some fine dining at any one of the fantastic restaurants or stop in anyone of the unique shops this town has to offer. Bonaparte Antiques always has great finds!